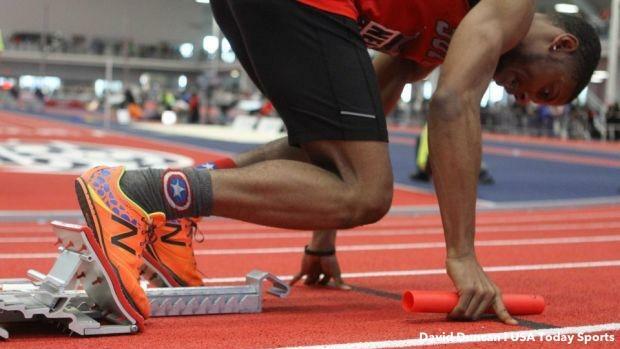 A difficult challenge for developing high school track athletes is learning how to use the starting blocks. In truth, success relies a large part in the set up before the gun goes off. Proper arrangement of blocks and body positions will yield an easier executed, and more powerful clearance. Block pedals should be staggered -- one farther back than the other. As a general rule, the front block should be 2 shoe lengths back from inside of the starting line, and the rear block should be 3 to 3 1/2 shoe lengths back from the starting line. As for height, set the front block as low as possible. The back block can be set a notch or two higher. These measurements are a good beginner's distance from which to make finer adjustments for the long term. 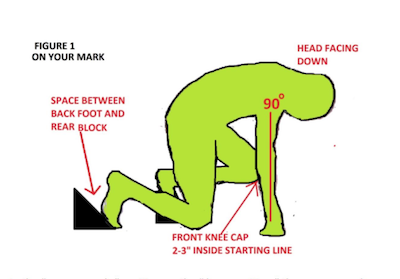 - Hands on ground just inside the starting line, shoulder width or a little beyond. Fingers spread. - Arms perpendicular to the ground (90 degrees) if viewed from the side. - Only the head is sticking out past the plane of the start line. Eyes down. - Knee of the back leg is resting on the ground. - Knee of the front leg is off the ground and approximately 2-3 inches behind the starting line. (If the sprinter looks down at the front leg's kneecap and it is past the line, then move the entire set of blocks back an inch or two and test it again. Repeat as needed). - Arms stay generally perpendicular to the ground as the body rises, with very little forward tilt -- maybe an inch at most. - Many novices don't raise the hips high enough, they need to go a bit higher then they think. - Head stays down so that the neck stays relaxed. - As the body moves upward into the set position, the space between the back foot and the rear pedal closes up. The bottom of the back foot will move back toward the rear block and onto it, creating pressure on it. - *At the top of the set positon, if there is a still a space between the back foot and rear block pedal, the athlete is either titling forward too much on the way up, or they're not raising the hips high enough. - At the conclusion of the set position, the shin angle of the front leg should be around 45 degrees to the ground. 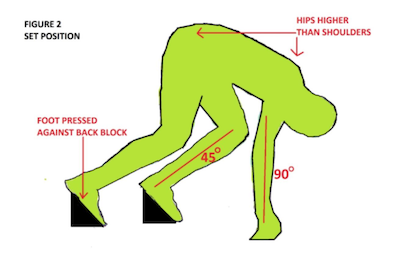 A shin angle too parallel to the ground will cause too flat a projection, or diving out of the blocks. From the set position described above, the sprinter waits for the gun. When the gun fires, the focus should be to push as hard as possible off of the front block. So hard in fact, that sprinter basically leaps from the front block. While it's true that both feet should push from the blocks, the sprinter does not need to be concerned with pushing from the rear block. This is because as long as there is pressure on the rear block in the set position, a hard push from the front block will automatically (reflexively) trigger a push against the rear block. Thus, the athlete can focus on the front block and pushing immensely hard from it.